Did you hear the one about the Global Wine Crisis? If you didn’t, it’s hardly surprising because the whole palaver was over almost before it began. The well-known finance company Morgan Stanley recently published a report announcing that a global wine shortage was on the way, as vineyards struggled to keep pace with steadily rising demand. Written by Australia-based analysts Tom Kierath and Crystal Wang, the report claimed that there’s just not enough wine in the world. The study reported that worldwide demand for wine exceeded supply by nearly 300 million cases in 2012 and blamed the shortfall, apparently the greatest in forty years, on bad weather and fewer vineyards. It added that there may not be enough wine in future years. 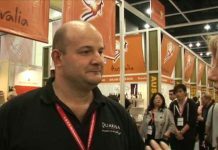 The report hit the pages of almost every national newspaper causing more than a flurry of anxiety in the world of wine. Then, as quickly as the panic began, it ended. Writer Mike Rothschild claims that there was one small problem with the Morgan Stanley report. It wasn’t actually true. Rob McMillian, Executive Vice-President of Silicon Valley Bank wrote that “the Morgan Stanley report is just wrong. In 2010 and 2011, we also thought we were trending toward a shortage in the United States but 2012 was a record production year and 2013 was almost as big. Everything we’re seeing is leading us to believe there won’t be enough tank space for all the wine production here.” California, which produces 90 percent of all US wines and is the fourth-leading wine producer in the world, has had nineteen years of consecutive growth. 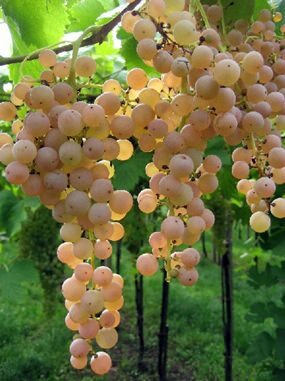 Garganega grapes on the vine (Photo: Consorzio Soave). 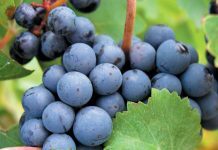 It’s true that because of bad weather, France has had two successive years of small harvests which has had a knock-on effect, producing an 18% increase in prices of quality wines. But there’s no need to horde bottles of Bordeaux in the fear that they’ll all disappear, even though hordes of Chinese are rapidly acquiring a curious taste for them. Yes, I know that locally produced boxed wines have recently been in short supply, but that is for a totally different reason and due entirely to fiscal measures introduced by the Thai government. So there we are. Panic over. Let’s have a glass of vino. There are times when it’s pleasant to drink a plain white wine, clean and dry with a dash of firm acidity and not much else. With some dishes, plain wines are sometimes better than those with buckets of fruit. Soave (So-AH-Veh) is usually such a wine. 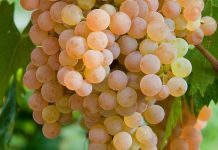 It’s probably Italy’s most popular white, made largely from Garganega grapes, one of Italy’s most widely planted light-skinned varieties and the most important white grape of the Veneto region. Garganega dominates Soave wines and usually blended either with the local Trebbiano or with Chardonnay. I suppose it’s about fulfilling customers’ perceived needs and all that kind of thing, because the Soave wines I have tasted recently seem to have more fruit and flavour than their clean-and-lean ancestors that I recall from the 1980s. This wine is a bit of the old school with a touch of modernity. There’s a very mild floral aroma which reminded me of pears and summer meadows and an attractive smooth mouth-feel with a nice crisp bite of acidity to give it a lift. There’s also a very pleasing dry finish. The touch of zesty crispness would make the wine excellent for an apéritif and at only 11% alcohol content you could easily enjoy a couple of glasses before dinner without feeling too heady by the time the soup arrives. It would work well with light chicken dishes or quiches. Although many people associate red wines with cheese (wrongly, in my view), this white wine would go well with Brie, Camembert or other creamy cheeses. It would probably go a treat with that Friday night traditional meal of British workers – fish and chips. Incidentally, Soave is not a grape variety or as some people think, a style of wine. It’s actually a place: a small town in the north-eastern part of Italy about fourteen miles east of Verona. Right, let’s sort out the label, so sit up straight and pay attention. Danese (Dan-EH-seh) is the name of the company. Montepulciano d’Abruzzo (mohn-teh-pool-CHAH-noh dah BROOD-dzoh) is a wine district which covers a vast expanse of land in the Abruzzo region between the Apennine foothills almost down to the Adriatic coast. It’s a bit to the north-east of Rome. The hillside vineyards get plenty of sun exposure and they’re cooled by dry breezes coming off the Adriatic. Named after the grape variety Montepulciano, the wines are often deeply coloured, smooth and mellow with spicy, peppery overtones. The grape is widely cultivated in Italy and by Italian wine law has to make up 85 percent of all Montepulciano d’Abruzzo wines. This one certainly lives up to its reputation, because it’s a dark coloured wine and has an attractive aroma of black fruit with that characteristic touch of black pepper and herbs. It’s a medium-bodied wine with a hint of acidity to contrast with the smooth mouth-feel. There’s a good, long finish with a touch of tannin and like so many Italian wines, it would really come into its own with food. However, it has a rather rustic feel to it and if you normally prefer smooth fruity reds you might not enjoy this very much. The touch of acidity gives it a lean body and I think it would make an excellent partner for paste in rich Bolognese sauce or a brightly-flavoured pizza. It would go well with mildly spicy tomato-based chili dishes too. And by the way, don’t get Montepulciano d’Abruzzo mixed up with another wine called Vin Nobile de Montepulciano. The names are rather similar but the wines are not. Vin Nobile de Montepulciano hails from the town of Montepulciano in Tuscany – about eighty miles south of Firenze. The wines are made not from Montepulciano grapes but from Sangiovese. Yes, I know it’s confusing. Blame the Italians.